The Shin Megami Tensei RPG series began in Japan in 1992 on Super Famicom. Neither this game nor its sequel was published in North America. In 2004 Shin Megami Tensei III: Nocturne was the first SMT game in North America, although "III" was removed from the PlayStation 2 title. The SMT series later spun-off several sub-series, including Persona, Devil Summoner, Devil Survivor, Digital Devil Saga, and the standalone Strange Journey. 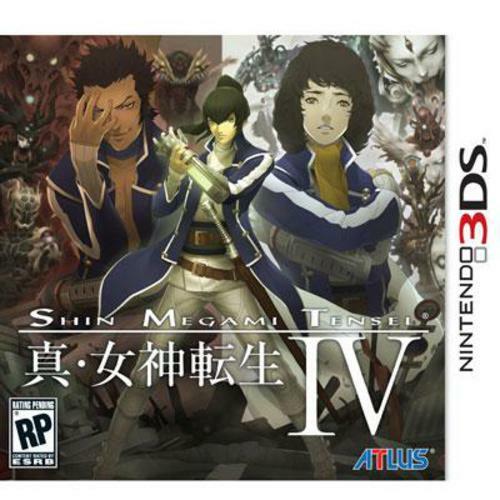 This new RPG is considered the fourth in the Shin Megami Tensei mainline series. In 1492, the Eastern Kingdom of Mikado is protected by high walls, with the castle and its king at the center. A young warrior, 18 years old, has just been chosen to become a Samurai, one who, with the aid of a special tool called a Gauntlet, will serve as a secret protector of the city. It is the duty of the Samurai to exterminate a demon threat of which its citizens are unaware. However, the situation is not as simple as human versus demon. There are factions within the human group that must be discovered and understood in order for alliances to be formed, paths set, and the destiny of the world decided. A World to Discover, A Mystery to Uncover: The life of a Samurai is fraught with peril. Players must leave the safety of the kingdom in order to defend it from the invading demons. There the story unfolds as they become involved in a fierce battle between God and demons. Shin Megami Tensei IV is a single player experience. Demon Collection and Fusion: The core mechanic of the Shin Megami Tensei series returns with more than 400 demons to recruit, collect, and fuse together. Players will constantly be challenged with balancing the strengths of their demons to ultimately excel in battle. Choices and Consequences: Throughout the player's journey, they must choose their own path. The choices will affect them, other NPCs, and the overall outcome of the story. Branching story paths require careful consideration since the Eastern Kingdom of Mikado and the post-apocalyptic remnants of Tokyo hang in the balance. Pressing the Combat Advantage: The Press Turn system requires strategic thinking for every battle. Pinpointing an enemy's weakness will provide a vital extra turn for players to exploit. But there are dangers as well...reckless attacks against demons cause players to lose their turns and give the enemy an opening to strike back. An All-Star Development Team: A decade in the making, the development team boasts the creative talent of staff from such well-known games and series as Persona, SMT: Nocturne, Devil Summoner, Trauma Center, SMT: Strange Journey, Digital Devil Saga, and Soul Hackers.